← Be careful what you ask for! This weekend, I helped decorate for a Halloween Party at my sister’s house. There’s an odd hallway that connects their main large public room to the rest of the house. It’s used for storage, and has shelves on both sides. 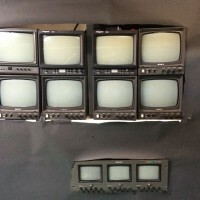 This year, I decided to decorate that area by creating a video wall effect. 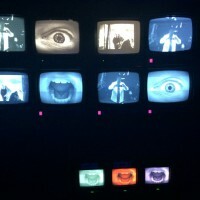 Something like a Television Control Room of Terror! 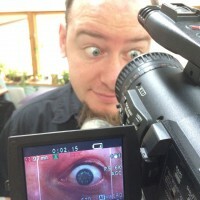 To start with, I simply filmed my brother-in-law with a video camera – only from WAY TOO CLOSE! I shot macro video of his eye and mouth. Then I edited the footage to create a custom looping DVD. In the hallway, I set up multiple monitors. 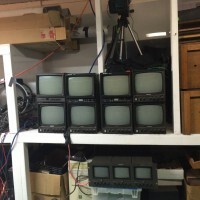 These are old monochrome standard definition monitors that were on their way to the recycling center. 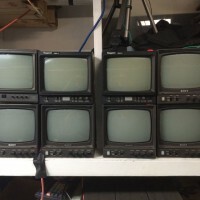 They were professional monitors, which means that they can pass a video signal through from one monitor to another, making it easy to daisy chain several monitors. 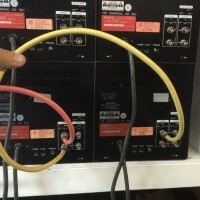 Next to the monitors, I set up three DVD players (including one car DVD player – hey I use what I got!) 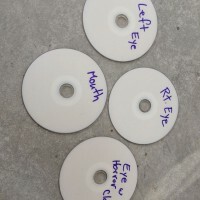 to play the three different custom DVDs – Right Eye, Left Eye, and Mouth. Each of the three videos is a different length, so they will continue to drift out of sync. 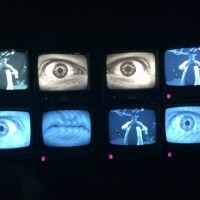 That way, as they loop, the visuals are a continuingly changing experience through the whole evening. 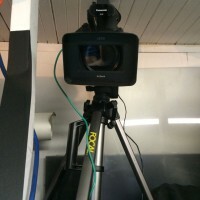 Above the monitors, I set up a video camera on a tripod and fed it to some of the monitors. That way, when party-goers look at the monitor, they also see themselves. 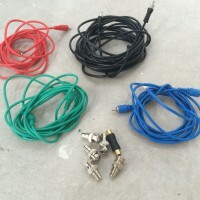 Having feedback on some of the monitors adds a sense of interactivity to the project. 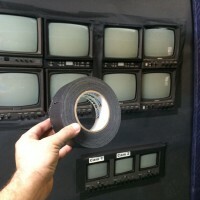 After the monitors and DVD players were all set up, I covered the rest of the shelving with black paper. In a dark hallway, lit only be black lights, it’s a great effect of creepy images floating in the hall. 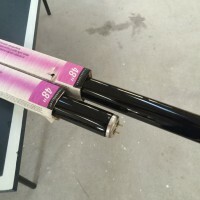 If you want more details on this project, I made a full step-by-step write-up on Instructables. 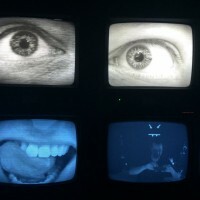 This entry was posted in art, camera, CCTV, electronics, recording, video and tagged Halloween, monitor, tv, video. Bookmark the permalink.